Dolphins are mammals adapted to marine life. 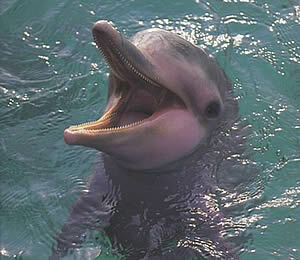 They have smooth skin and breathe through a blowhole on the top of their head. Their mouth has the appearance of a permanent smile. They are smart, creative and learn very quickly. There are many species of dolphins. The bottle nose is a coastal dolphin And it may be found in all the oceans. The sotalia, is smaller, gray in color with a pink belly and it is found only in the northern coast of Southamerica and in the fresh waters of the Amazon River. Dolphins have developed an advanced social structure. They can interact with human beings, establishing strong bonds with them. When this is achieved, dolphins and trainers have confidence in each other, and they both can be together in the open sea, and without loosing sound and eye contact, the dolphin will not disappear suddenly.